The crowd chants “Ole”. The screens show tumbling stars and murky comet belts. The constellations must mean something. A rush of sound takes over, and what looks like a chipper HAL9000 takes over. The crowd quiets. Baby-HAL asks “What time is it in the world?” This is Popmart, ZooTV without the irony. “Turn on your radio.” What? Is this a homage to the past, or a prediction of the future? The Edge’s guitar chimes again. “Sometimes I feel like I don’t know. Sometimes I feel like checking out,” Bono haunts. Light My Way – Bono sings into a neon steering wheel. He’s decked out in neon as well. His sleeves look like movie theatre aisles. A blacklight turns everything negative. Something sounds like thunder. The steering wheel is wired to the spaceshiptopus, and Bono is dragged around by the spectacle. “Baby, baby, baby, light my way.” I can’t, because I don’t understand. Strobe lights, neon red, and violet backdrops; this is everything from Achtung to Vertigo onstage at once. With Or Without You – The steering wheel turns hot-white and light purple. Bono’s jacket still looks like a runway. He fucks up on the bridge. It seems like we’ve all lost focus. Bono’s spinning on the steering wheel’s wire like a stripper, and the Edge is warbling into his Garth Brooks headset. Larry fucks up the timing, and I start to feel agitated. I hope I’m not the one cheapening this. No, because now Bono’s encased by a smoke machine. He hangs his Brite-Lite jacket on the steering wheel, and it ascends into the spaceship. 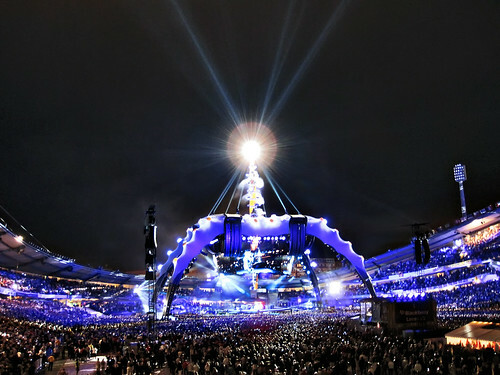 “I’d like to thank Live Nation, Univeral, Principle Management, Blackberry, all the people who helped us build this view. Thank you all for building this.” He thanks celebrities like Beckham and Johannson. Moment of Surrender – An incredible song. Best on the new album. What will they do with it? Bono starts raw, but he can fake that. The lights are subtle red, but the cameramen can’t help to widen up, show the big screen. The spaceship’s legs are finally unlit, but why can’t the lenses stay tight? “I could see in the reflection a face staring back at me.” LMJr. is on vocals with Bono and the Edge. The slide solo comes, and I’m actually there. The cameras can’t take that away. “Every eye looking every other way, counting down ‘til the pain would stop.” Bono tries to pound into the crowd. He rhapsodises, and in spite of it all, I believe it. He tells me God is my reflection. The song ends with an ascension into major, but I’m still in the minor key. They walk off, I shut the Macbook, and I’m in the dark. Good Stuff TJ. One thing is for sure, U2 creates a dialogue about music, good and bad. Love em or hate em, at least people are pumped up enough to write something.